Chilean writer Isabel Allende’s classic novel is both a richly symbolic family saga and the riveting story of an unnamed Latin American country’s turbulent history. In a triumph of magic realism, Allende constructs a spirit-ridden world and fills it with colorful and all-too-human inhabitants. The Trueba family’s passions, struggles, and secrets span three generations and a century of violent social change, culminating in a crisis that brings the proud and tyrannical patriarch and his beloved granddaughter to opposite sides of the barricades. Against a backdrop of revolution and counterrevolution, Allende brings to life a family whose private bonds of love and hatred are more complex and enduring than the political allegiances that set them at odds. The House of the Spirits not only brings another nation’s history thrillingly to life, but also makes its people’s joys and anguishes wholly our own. Isabel Allende is Chilean and worked for many years as a journalist. She now lives in the San Francisco Bay area and has recently published her fourth novel. "Extraordinary... Powerful... Sharply observant, witty and eloquent." "Nothing short of astonishing... 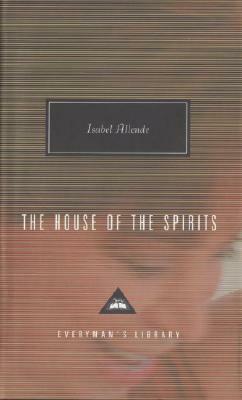 In The House Of The Spirits Isabelle Allende has indeed shown us the relationships between past and present, family and nation, city and country, spiritual and political values. She has done so with enormous imagination, sensitivity, and compassion." "Spectacular . . . A unique achievement, both personal witness and possible allegory of the past, present, and future of Latin America." "That rarest of successes–a book about one family and one country that is a book about the world and becomes the world in a book." "The only cause The House of the Spirits embraces is that of humanity, and it does so with such passion, humor, and wisdom that in the end it transcends politics . . . The result is a novel of force and charm, spaciousness and vigor." "[Allende] mixes fiction, journalism, and a sense of magic in an epic that qualifies her as one of Latin America's most inspired writers." "[Allende is] another remarkable storyteller from a continent blessed with many such enchanters . . . Allende has an affection for her characters quite beyond politics, and an estimable ability to bring them to life."